Only 2 weeks before the next marathon so I kept on training but slightly lowered the intensity. On Tuesday I went out for an easy 12k run. My legs felt really tired but after 7k I felt better and ran through Bushy Park and the young deer with a bit more speed. Wednesday was the speed training day and I did a warm up and then 5×1000 at around 3:50 m/km with 2 minutes rest, for a total of 12k in the wind and rain (where is the summer gone?). I suffered quite a lot. Probably the long week ends, the wind, don’t know, but it felt like I was giving it all. On Thursday I went for an easy run (15k at 4:38 m/km) via Richmond Park. The new part I have never explored before is really cool, that wild hill (see last post) is really fun to run both up and down. Friday I ran 5km of warm up and then 5k sort of fast (at 3:54 m/km). It was very cold in Bushy Park, almost like May, and we are in July! At the end of the warm up I had a bit of fun with the GPS. On Saturday I did a long run. 30k at 4:45 on the path from Hampton Court to Weybridge. I felt pretty tired at the end and happy to be back home. It was a very hot day. I also decided not the eat any gels to learn to burn fat better. I don’t know about burning, but I definitely sweated. I lost 3kg in 2 hour 22 minutes! 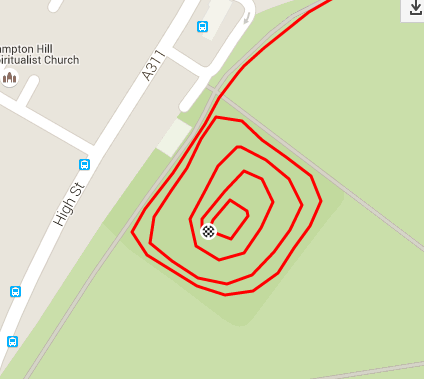 Sunday I did the usual 20k around Richmond Park, again looking for the outer smaller paths. Took it easy, but had fun. Nice way to finish the week. Overall nothing special this week. 101km in total and now it’s time to taper.